Am I in a Rezone Area? Hamlin Park Threatened by City Proposals – Stand Up and Save It! The City of Shoreline is threatening yet another crucial neighborhood asset, Hamlin Park. Hamlin Park was a longstanding King County Park the City inherited when Shoreline incorporated. Thousands of visitors come to Hamlin Park each year, for nature walks, dog walks, baseball games and the forested playground. For the last few years your neighbors at Shoreline Preservation Society have been working to protect two huge neighborhoods from the Radical Rezones. Though we weren’t able to stop them, we were able to protect some important areas around parks. But now we must focus on a new threat. The City is proposing a huge new Utility Yard right at the current entrance to the beautiful Hamlin Park. This 4.5 acre section of the park is a healthy urban forest with healthy understory and hundreds of trees and a new road entrance at 162nd Street, that will further disturb the delicate natural balance in this ecosystem. This is currently being discussed amongst staff and was presented to Council as a solution to a self-created problem. That is, they bought an old King County Utility Yard to be their new facility next to Bruggers Bog and then discovered that the creek there and underlying wetland would not be practical for a utility yard with all its heavy equipment. When SPS and community found out about this proposal we launched an immediate effort to stop this unconscionable idea. We held a rally, send dozens of comment letters and testified at the Council meeting. We said, “do not put the community through another excruciating public process with your forgone conclusion already determined!” But staff has, currently decided to forge ahead with this process. Acres of precious urban forest in Shoreline is irreplaceable! We need more parks space, not less! The reality is that there are plenty of other places to build or expand a utility yard, creating an ugly industrial site in a residential neighborhood. But destroying 4.5 acres of urban forest is all wrong! It is not environmentally sustainable, it will not reduce Climate Change and will only ruin an intact ecosystem that has great importance to our community. Now we are raising the necessary funds to fight this hideous proposal and we need your help. We want to print 250 Yard Signs and create materials to inform the public and educate the Council about the value of preserving Hamlin Park and further enhancing it rather than invading it with an ugly utility yard. Then, please send a comment letter to the Shoreline City Council. (If you already have, thanks! Feel free to send another one!) Tell them to drop this idiotic proposal and instead work on creating more parks, especially for the Rezone Areas affected by the Light Rail Transit Oriented Development! Then stay tuned and prepare to attend upcoming council meetings and testify, advocating for protecting this jewel of a park! It is up to citizens to protect this wonderful urban forest! Thanks very much. Feel free to call or email me if you want more information or share ideas. Why is Shoreline in a rush to do this to our neighborhoods? Why is the City considering to allow new development up to 14 Stories to occur in these neighborhoods? What will be the impacts to traffic throughout the City and parking in the affected neighborhoods? What will be the impacts on our parks, wildlife habitat, trees, schools, utilities, and more? Who will pay for all these impacts? The City of Shoreline is proposing two major rezones to accommodate Light Rail Station Areas. One is in the 185th and Fifth Ave NE and one is in the Ridgecrest/Parkwood Neighborhood north of 145th St (State Rt 523). These proposals are in stages of EIS process and review currently. There are two City formulated “citizens committees” that have been tasked with reviewing these plans and the Light Rail Station Areas. Many of the local citizens who will be most affected by these rezones are anxious and alarmed at the scope and scale of these proposals. There is great concern about the actual impacts on the environment and the daily lives of residents who live nearby or utilize roadways that feed into these neighborhoods. The cumulative impacts of these proposals are not clear, but we believe that answers need to be forthcoming as to how our City and region will actually implement these proposals. Also, we are asking whether these proposals should be scaled back to more reasonable levels and/or phased in at a predictable level. SPS believes that “Smart Growth should truly pay for Growth” and that the burden should not be solely upon individual local taxpayers and rate payers to fund infrastructure improvements needed to accommodate these huge rezoning proposals. Hamlin Park Alert! Forest or Concrete? * Stand up for Hamlin Park! Monday, October 9th, 7pm. Shoreline City Hall – Sign up to speak for 2 minutes about why you care! See you there! And thanks for caring! We are making a difference! Save Hamlin Park Signs Now Available; Plus, Two Upcoming Opportunities to Show Up and Speak Out at Shoreline City Hall! Our Save Hamlin Park Signs Are Now Available! 1: Tonight at the City of Shoreline Parks Board Meeting, Thursday, 9/28/17 at 7pm, Shoreline City Hall, Room 301. 2: The October 9th Shoreline City Council Meeting, Monday, 7pm, Shoreline City Hall Council Chambers. Hamlin Park must be saved from Shoreline Public Works’ power grab! The Public Works Department is taking advantage of a loophole in our code to try and override Hamlin Parks’ status as a unique Urban Forest and take over 4.5 acres of trees for an ugly Utility Yard and also punch through a new road right at the current entrance. The Public Works Director is playing on sympathy for staff to beg for a huge expansion of their existing Utility Yard. This is completely unacceptable and is an unconscionable misuse of City Park property. Shoreline Preservation Society is pushing back and fighting to stop this! What can you do to help stop this atrocity? Show up at Council any Monday and testify! Write to Council about why this incursion is a terrible idea! Donate funds to SPS to help fund this effort to educate the public and the Council. Hamlin Park Threatened by City Proposals – Stand Up and Save It at Hamlin Park Rally on Monday! Shoreline City Council has scheduled a Special Meeting/Tour of all Utility Yard options this coming Monday. Hamlin is staff’s top choice now! We simply cannot allow this terrible idea to take seed! Where: Meet at the Hamlin Park Entrance. Bring: Friends, Family, Kids, Dogs, Homemade Signs, Balloons, Streamers. Some extra signs will be available. Join the Shoreline Preservation Society in opposing this unconscionable plan. Hamlin Park’s entry area is where the City is considering siting an ugly utility yard. The City of Shoreline is threatening yet another crucial neighborhood asset, Hamlin Park. Hamlin Park was a longstanding King County Park the City inherited when Shoreline incorporated. Thousands of visitors come to Hamlin Park each year, for nature walks, dog walks, baseball games, and to experience the forested playground. Do we want beautiful greenspace or more concrete? Ridgecrest and surrounding neighborhoods are already impacted by heavy upzoning. We need more parks and urban forest, not less! proposal and instead work on creating more parks, especially for the Rezone Areas affected by the Light Rail Transit Oriented Development! Fircrest School for the Disabled is under threat of being shut down. Please tell your legislators and senator and all of those serving on the House Rules Committee that you are supporting the Master Plan and maybcommending Alternative #2, and that THEY need to save Fircrest, because it is an asset to the She reoreline community AND that the fragile and disabled residents’ lives depend on it remaining and remaining strong. Tell them none of the property should absolutely not be sold off or “surplussed.” And any additional development should be “compatible” with the needs of the disabled residents. There are over 200 residents now residing at this State facility. These are all photos of the beautiful campus of the Fircrest School for the Disabled. It is in my neighborhood, Ridgecrest in Shoreline! Historic Fircrest is now threatened by a bill in the WA State Senate SB #5594. It will then go to the WA House Rules Committee. If you live in on e of these members Districts and you care about disabled people, please send an email to these legislators and kindly ask them to save our beautiful Fircrest for the health and wellbeing of the residents and our neighborhood! Don’t let Dino Rossi, who does not even live in our district dictate what happens to Fircrest! Please call Senate Rules Committee members TODAY! Thanks! (2) Fircrest is a full service, therapeutic community that serves the needs of some of the state’s most difficult-to-serve residents with intellectual developmental disabilities. They would be more difficult and more expensive to serve in the community-at-large. (3) Fircrest is also a vital part of the State’s safety net for non-RHC residents’ in need of expert crisis stabilization. (4) Fircrest’s s location and services are valued by the Shoreline community. 5) Instead of closing Fircrest, legislators should insist on the language in the Governor’s Capital Budget that funds the Fircrest Master Plan. (6) Via capital investments for replacement of two buildings + a revenue producing water tower, the Fircrest master plan will provide ongoing operational savings. are determined during the next phase of the master planning process. (8) Keep Fircrest open to keep Fircrest families together. Well, the “imagineers” at the City of Shoreline are at it again! It came to our attention this last week that a proposal for a 9 Million Dollar Paved Trail to be sited along the Light Rail Line for biking/pedestrians has mysteriously surfaced from out of nowhere, in no time at all. That right people, a NINE MILLION DOLLAR, 3 mile, narrow strip of asphalt! Now, we’re all for biking and walking, and this seems like nice idea at first glance, but when you start to think about the logistics, topography, isolated location, and whether this is going to be of high-use for the pricetag, the concerns begin to stack up. Based on the city’s past performance with how the rezones were pushed through, we have valid reasons to be rightfully concerned and push back now, before this turns into another overpriced, out-of-control, runaway train. (Pun fully intended!) and “jobs program” for consultants. We’re going to have bikes lanes on 5th Avenue. Funds and resources should be focused on making these safe and separated bike lanes. 5th Avenue provides better, shorter, more direct connectivity between the 145th station, “Downtown Ridgecrest”, Paramount Park, the Library, and the 185th St Station. A short trail between the 185th station and 195th ped-bridge may be useful. Having two routes, running parallel, basically a couple blocks away from each other, seems like duplication of efforts and extremely wasteful, especially for the high price tag. Keep in mind we already have a North/South route with the Interurban Trail near Aurora, as well as Burke Gilman to the East next to Lake Washington. There is no safe separated connectivity between these trails and the stations. Better bike access coming from Burke Gilman would encourage more people from Lake Forest Park, Kenmore, Brier, Juanita, Bothell to commute to the stations via bike. If the idea for this trail is to eventually go all the way to Everett along the rail line, it’s going to run into some major obstacles when crossing into Mountlake and the State Highway interchange, and going to duplicate efforts and be running parallel to the Interurban where the rail crosses over to the West side of I-5. At Echo Lake Park and at Meridian we have huge gaps in safe, seperated bike connections on the interurban and 195th pathway… basically dead ends. If the idea for the Trail to Nowhere is to connect to the trail at Jackson Park, well, the South End of that trail is… another dead end. Why would anyone take a steep, indirect, out of the way route to walk/bike to the station when they could take 5th Ave? We suspect that not too many people want to bike, run, walk, or otherwise exercise next to the exhaust, noise, and pollution rising up from I-5. It’s a public health hazard. Then you have the possibility that this trail will be very isolated as the distance increases from the stations. One only needs to look at our existing combination of transit center plus less isolated trail where Aurora Village meets the Interurban… needles, trash, etc. If our community can’t even address one problematic area, why create another? Could this set the stage for having our very own “Shoreline Jungle” along I-5, “Under the Rails”. It’s going to be a huge public safety burden for our law enforcement to patrol as there is little accessibility by road to this proposed trail. Who’s going to pay for that burden? Sound Transit?… nope… we are. Also, after dark, if you had to make your way by bike or ped alone, would you prefer to do so along an un-isolated, well-lit, main thoroughfare such as 5th, with lots of foot traffic, businesses, and people milling about where you could run a few errands along the way? Will this be an excuse to “grab more land”, upzone more of neighborhoods, and clear away more of our already threatened tree canopy? Upzoning along the rail between the two stations was suggested last year by a Planning Commissioner, so this possibility has been on our watch list. Is this going to be used a sorry excuse for park space in the subareas as required by the Growth Management Act? A park space with two uses/activities… walking or biking on a paved trail with no actual greenspace or opportunities for tree replacement for the massive clear cutting to take place to make way for the rail line? Will this be bait and switch by Sound Transit to weasel their way out of having to replace and pay for the sound barrier, build the much needed ped bridge near 147th and I-5 bridge? Where Did this Trail to Nowhere Proposal Come From? And who approved the $275,000 price tag to not only pay for the study out of the city coffers, but for it to go forward in the first place? As far as we can tell, this proposal surfaced in October 2016 and slipped into the budget before the public was properly notified. Are they having a public meeting now purely to give the facade that public input was involved when decisions appear to have been without public input: The city appears to be at is at again with their “illusion of choice”… there is no choice for “no trail”, focus on the 147th st ped /bike bridge, and completing cycle route gaps elsewhere in Shoreline, so we have useful and functional connections. “We don’t know” is not an acceptable response to any of these questions from policy/decision makers. We have no business spending up to $300K of public funds on a “study” if these questions can’t be definitively and honestly answered beforehand. SEE YOU TOMORROW NIGHT AT CITY HALL!!!! Your feedback is requested to help develop a preferred trail alignment plan for a possible multi-use trail running roughly parallel to the light rail alignment through Shoreline. Development of light rail through Shoreline presents us with a unique and rare opportunity. The City is looking at the possibility of building a multi-use trail running roughly parallel to the light rail alignment through Shoreline. Located on the east side of I-5, the trail would run from N 145th Street to NE 195th Street. It would enhance pedestrian and cyclist access to the planned 145th Street and 185th Street Light Rail Stations, as well as connect to the NE 195th Street pedestrian bridge over I-5. 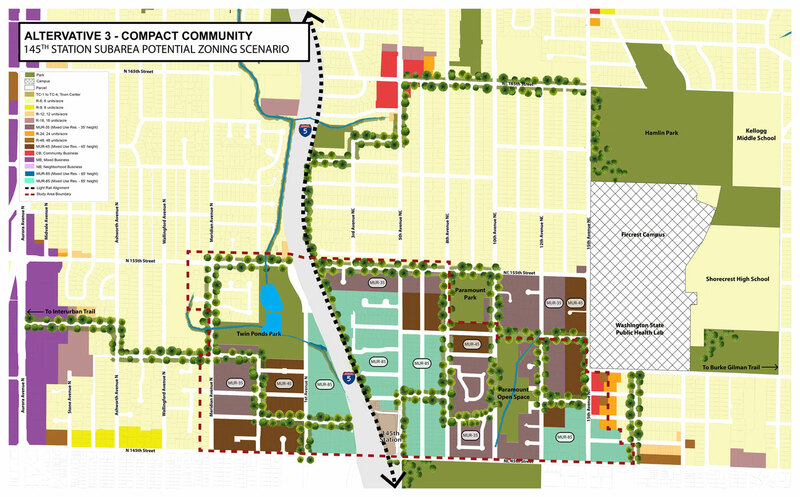 In addition, the trail could connect to local streets, parks, open spaces, and schools within the neighborhoods adjacent to the light rail alignment. Similar to the Interurban Trail, the “Trail Along the Rail” could serve as Shoreline’s segment of a potential regional multi-use trail that could ultimately connect cities along the Lynnwood Link alignment from Seattle all the way to Everett. As the first step to testing out this vision, the City will conduct a feasibility study of a trail along the planned light rail alignment. We need your feedback to develop the preferred trail alignment plan. Please come to the public meeting on Wednesday, March 15 and provide your input. This Monday, 9/12/16 – A Crucial Opportunity to Speak Out Against the 145th Radical Rezone! Monday night let your voice be heard at the Shoreline City Council meeting regarding the 145th Street Rezone! This is a CRUCIAL meeting. It is nearly our last chance to get across our opinions about protecting our neighborhoods from the enormous “Radical Rezone” they have planned. Is the legacy you wish to leave in Shoreline that of concrete, treeless acres of urban blight? Or density with grace that protects our greenspaces and tree canopy? The Shoreline Preservation Society has been fighting for over a year to protect our neighborhoods. Though we have not achieved everything we had hoped for, we are certain that we have made a difference. While it is still too big and egregious and flawed, the current proposal is less drastic in fact than the 185th Rezone was. If you live in the rezone please comment on what specific changes you would like to see to the zoning of your lot and why. What changes do you want to see to the zoning nearby and why? What changes to the rezoning process would you like to see such as, is it appropriate to deny citizens the right to comment once specific projects are proposed? Do you feel like the Planning Commission has taken your previous comments seriously? If you sent in comments in writing ahead of the meetings did you hear any discussion of your concerns during the Planning Commission meetings? If you live outside the rezone, how will the current proposal impact you where you live? Please keep comments specific, succinct and RESPECTFUL in order to have the greatest influence on the Council members. We need your help NOW. Please send a written comment and plan to attend the meeting and plan a short comment if possible.. A big turnout sends an important message. Thank you for all you’ve done thus far and for standing up for Shoreline Neighborhoods.